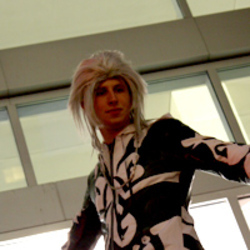 Starting his cosplay journey in 2009, he has quickly made a name for himself with his iconic cosplay character of choice, Xemnas from Kingdom Hearts II. His first event was FanExpo Canada 2009, and since then has been attending many of the conventions in the Southern Ontario region, as well as Otakuthon in Montreal, and Metrocon in Tampa Bay. In his cosplay time, he has founded the Ontario Cosplay Community, with over 1,400 members to date and chairs FrostCon a cosplay convention in Toronto. He's a passionate individual, who wants to help network the cosplay community together, for those new and people returning to the hobby. In addition to cosplay, he is a registered makeup artist, and loves classic cartoons, wrestling, anime, video games, and photography!